For quick, easy, less-hassle and gimmick-free Stone Benchtop Installation in Perth, call Medici Marble & Granite. We have extensive experience in supplying, installing and fabricating stone benchtops in Perth, and we are proud of the integrity and credibility we have embarked in the industry. 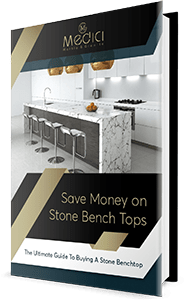 For stone benchtop installation we have available services like marble stone benchtop, granite stone benchtop, porcelain benchtop and engineered stone benchtop. At Medici, our makeover to a standard size kitchen benchtop and splashback should be less than two days with limited demolition required, which means disruption and mess are minimal. Replacing your existing benchtops with Medici Marble & Granite couldn’t be easier. Every benchtop installation is tailor-made to not only fit your specifications but also to suits your lifestyle, and your house design. We don’t install benchtop for business; we do it to make our customers happy and satisfied as they get the best value of what they pay us for. ● Size & Complexity – larger, more complex jobs will take longer than smaller, simpler jobs. In particular, the number of joins necessary increases the time needed, because if these need to be perfect. ● Site Access – if the work area is hard to access more time will be spent lifting and moving the stone. This can add significant time if stone needs to be brought outside again for trimming. ● Adjustments – Our stone is cut perfectly straight; unfortunately, not all walls are finished to the same level of precision. When there’s a mismatch between the wall and the stone our team will need to either chisel out the wall or trim the stone. This adds time. ● Polishing – Certain features, such as splashbacks and mitred-waterfall ends, cannot be polished until they are on site. Polishing doesn’t take that much time, but it adds up for large projects. Installation for smaller jobs typically falls into the range of $X to $Y, while larger jobs normally cost at between $Z and $A. Please note that these are guidelines only and represent averages; your project may fall outside these ranges. The best way to find out how much your installation costs is to contact us online for your free quote or call our team on (08) 9303 2697. Our teams will bring everything they need for your installation, all you need to do is to make sure there’s access to the site and that the area is clean and clear ready for work. If possible, avoid scheduling other trades to work in the same area at the same time, as this can drastically increase the time it takes to fit. Will There Be Many disruptions In The House During The Process? Our teams will aim to minimize disruption whenever possible, but some noise and disruption is inevitable. The worksite itself will be a no-go area while fitting is in progress, so if you’re having new worktops fitted in your kitchen, you may want to consider making lunch in advance or finding an alternative arrangement! Our teams are neat and tidy and will put down sheets to protect your home décor where necessary. The messiest task is trimming stone, which we will always do outside if possible. The process starts with a free on-site consultation from which a quote will be individually drawn up to suit your specific requirements and budget. After the quote is accepted, and approved, our enthusiastic, approachable, hard-working, and insured team will proceed with the installation process. Then get your kitchen, or bathroom look fabulous and elegant all over again – making sure it will serve you for a long time that you can even hand it down your generations if possible. We also practice installation which is less messy. We don’t like demolishing too much. If we can install the benchtop by merely fitting into the place then get them bonded directly on the top of your old benchtops, without creating any mess, we’d surely go for it. If it doesn’t require us to entirely remove the old benchtop which will save you valuable time and money, then we will choose that process instead. Wherever you use our pieces for kitchens, bathrooms, floors to hallways, Medici Marble & Granite will give you a result that is beyond your expectations!